7TH AVENUE OFFICE COMPLEX IN THE NEWS! 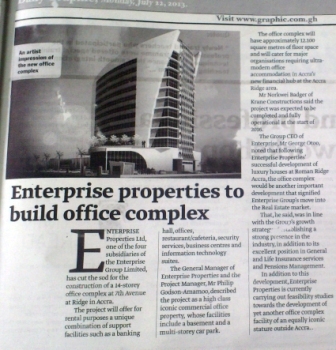 Monday’s Daily Graphic featured an article on STA’s 7th Avenue Office Complex on Page 59. The news captured the site handing over ceremony and the sentiments of Enterprise Group Ltd and Krane Construction Ltd; STA’s partner in this design-and-build project. See project page for details on the project.